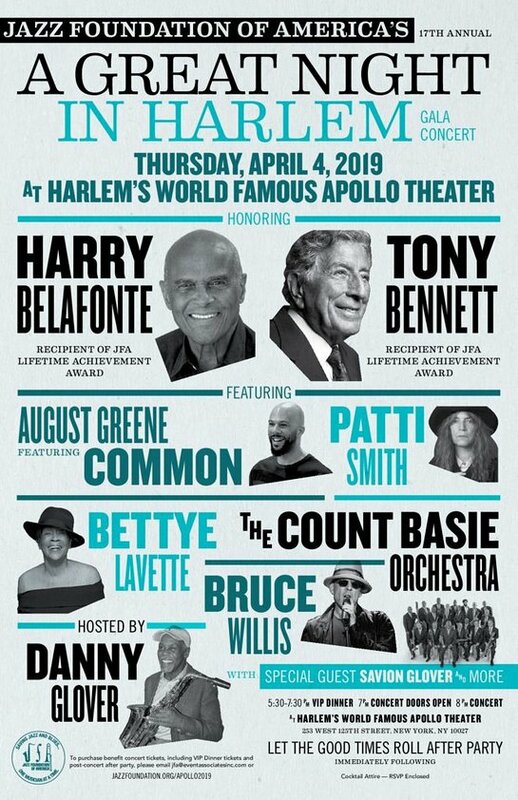 Thursday, April 4, Danny Glover will host the Jazz Foundation of America's annual gala concert at Harlem’s world famous Apollo Theater. 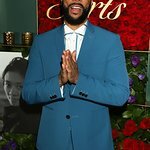 Since 2001, the Jazz Foundation of America has produced an annual gala at the Apollo Theater called “A Great Night in Harlem.” This benefit concert is always one of the best nights of the year in New York City. It brings together all-time legends and unknown gems from the worlds of jazz, blues, rock, and soul in support of musicians in crisis. Singing legends Harry Belafonte and Tony Bennett will receive JFA Lifetime Achievement Awards. Featured performers include August Greene featuring Common, Patti Smith, Bettye LaVette, The Count Basie Orchestra, and Bruce Willis, with Special Guest Savion Glover and more surprises to come. Now celebrating 30 years, the Jazz Foundation has been keeping jazz, blues, roots, R&B, and soul alive by helping the musicians who have played with everyone from Duke Ellington and Billie Holiday to Jimi Hendrix and The Rolling Stones. Their social work services provide housing assistance, pro bono medical care, disaster relief, and emergency financial support to musicians and their families in times of crisis. Through their Jazz and Blues in the Schools and other performance programs, they create dignified employment for musicians who are too old or too ill to tour, and reach thousands of public school children every year. Whatever the need is, they don’t just fix the problem, they strive to heal it with creative solutions and love. Your support to the Jazz Foundation helped provide assistance in over 9,000 cases last year alone, throughout the United States, including their ongoing efforts in Puerto Rico.